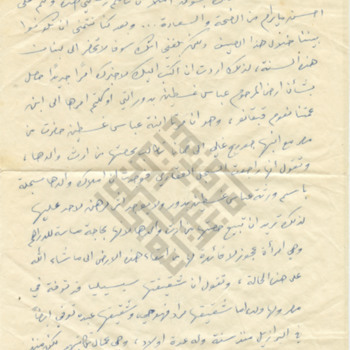 This letter certifies Eva Baddour's baptism date as February 15, 1899 in St. Romane's Church, Hammana, Syria. It was signed by Rev. Elias Hadshety on October 8, 1915. Facsimile of a portion of two documents presented to Mitchell Baddour, who was honorably discharged by the U.S. Navy in March 1946.
caption: "U.S. Navy Landing Craft Aboard U.S. Navy LST [Note: Landing Ship, Tank]"
A photograph taken by Mitchell Baddour during his time serving in the US Navy. Mitchell David Baddour and friends of the United States Navy, all in uniform. Baddour is third from left. A photograph of a U.S. Navy Land Craft taken by Mitchell Baddour during his time serving in the US Navy. A portrait of Mitchell David Baddour in his navy uniform. A hand-tinted photographic portrait of Victoria Alkazin Baddour. A hand-tinted photographic portrait of Shickrey Baddour. A studio portrait of Shickrey Baddour with his two oldest sons, Seef Charles and Joseph, from his first marriage. A photograph of young Victoria Alkazin before her marriage to Shikrey Baddour. A studio portrait of young Victoria Alkazin before her marriage to Shikrey Baddour.